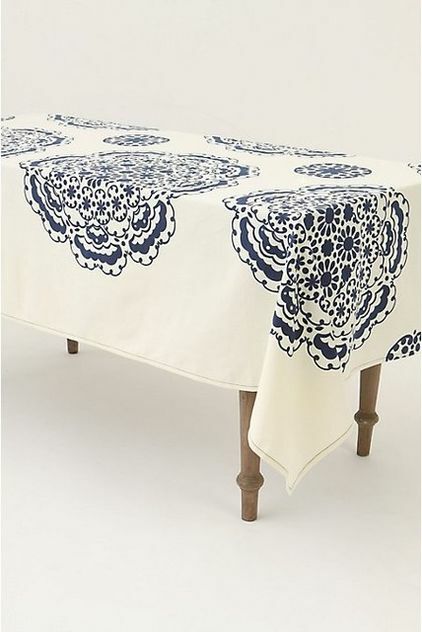 I love a good tablecloth. Growing up, my mom would set the table every night for dinner no matter how busy we were, how many activities we had... The table was always complete with a beauty tablecloth, napkins and candles, making each dinner always feel special. And to this day, she still sets the table every time. Even if we are sitting outside at the cottage eating pancakes and bacon, the table is set with all the trimmings. 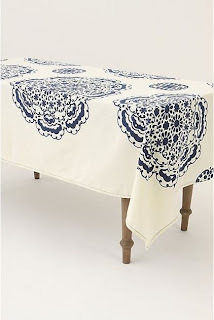 Because of this, I have found a certain comfort in always using (and purchasing) a good tablecloth. At my own apartment, my dining room table is always set, either with a tablecloth or a table runner, some flowers and a few candles. I think that it brightens up my small 600 sq foot space, and during any festive season I like to "set the table" according to what is going on: Halloween, Thanksgiving, Christmas, Valentines Day, Easter etc etc. It's a small hobby of mine, so I am always on the hunt for some great & versatile tablecloths. 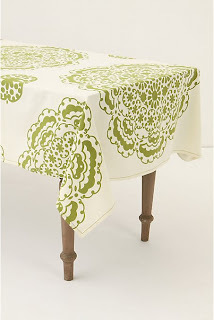 I thought I would share a few ideas behind purchasing a good table cloth and what patterns to look for. 1. 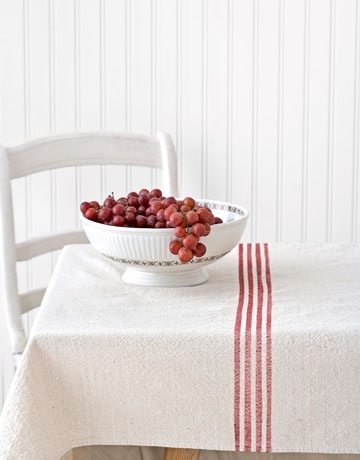 STRIPES: stripes and single lines are a classic that you can't go wrong with. Clean and fresh cut, they are perfect for breakfast, or a rustic type picnic meal. 2. 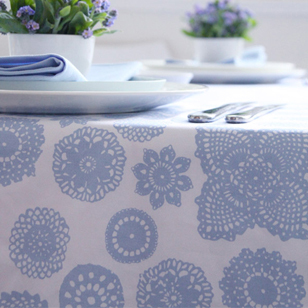 FLORAL: Nothing says summer or spring like some bright coloured floral lining the table. Put some potted herbs in a vase as the table decor and you will be sure to wow your summer guests. 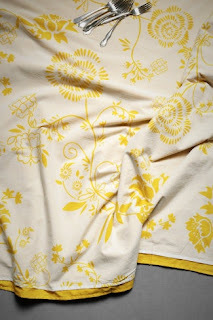 This type of floral pattern would also look great with a table runner made out of burlap on top. Very summery, very fun. 3. PRINTS: Have fun with prints. They are all about making a bold statement. 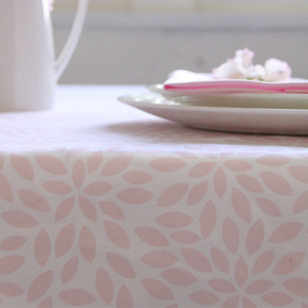 Below is the same sort of print in two different colours, you can see how different each table would look depending on the colour you choose! 4. 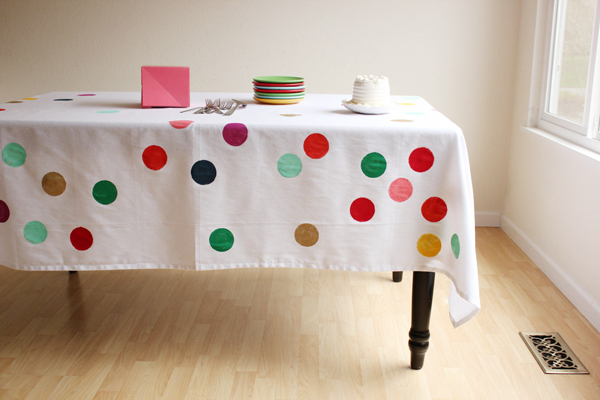 POLKA DOTS: Kid friendly, and perfect for a birthday party or a kids play date. A polka dot print is a staple for any kid filled house! 5. GIRLY: Who doesn't love a pretty pink or purple to brighten up the mood. Go with lighter tones on these ones, and watch your white plates and flower decor really stand out! 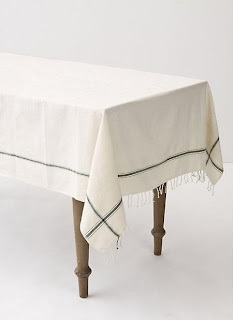 You have share a very nice information about a table cloth which really a helpful to me. I want to buy a new table clothes for a my dining rooms table so i hope that this information will be helpful for me to choose a best design and material made table cloths. Emma's Eatery is a fusion of food and fun, told through the young eyes of a food fiend. All things culinary - from trendy restaurants to tasty recipes, the blog is intended for anyone who loves food! Theme images by linearcurves. Powered by Blogger.